Hi everybody! We’re back with Frank updates! 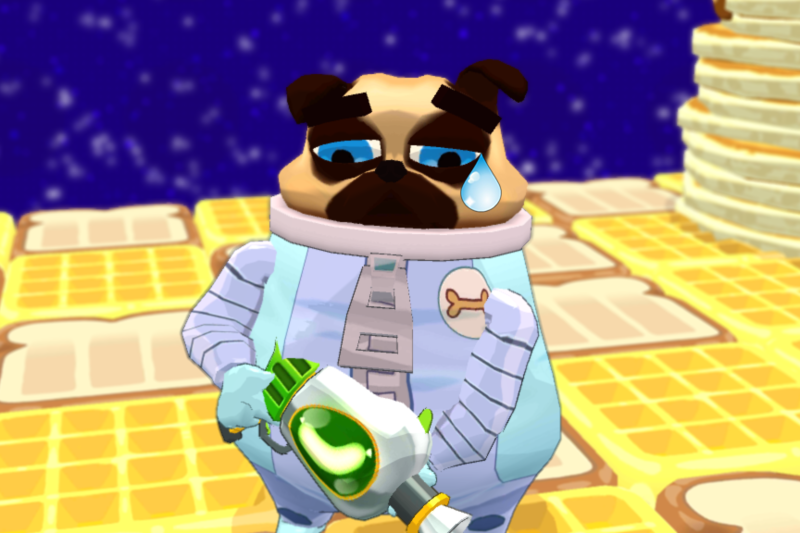 Frank from Earth is looking more and more like a real game everyday now, and our team couldn’t be prouder. Also, I couldn't be prouder of our team. They've been at it for over 2 years now and I think it shows. Not to get all mushy, but I really don't know what I would do without them. 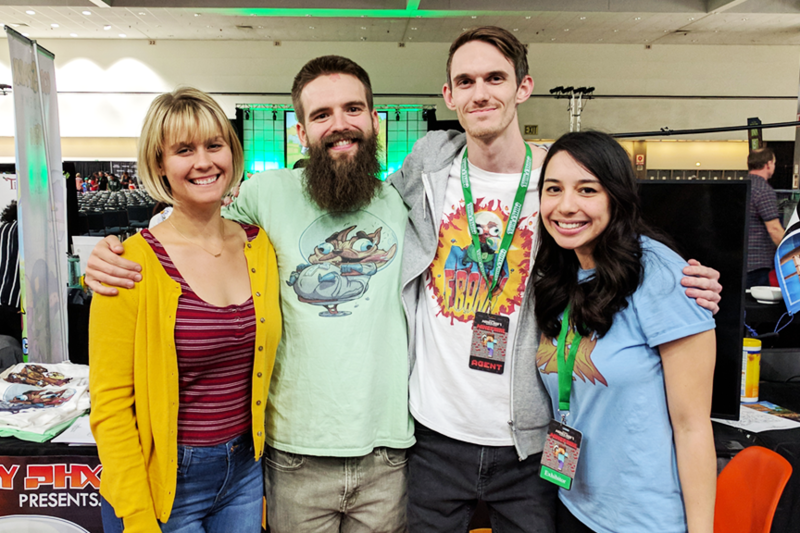 We just got back from our third convention where we shared our latest Frank updates to the lovely people at Minefaire. Now we want to share with you too! First, story time! Liz recently moved to LA and has been going to a local game dev meetup. 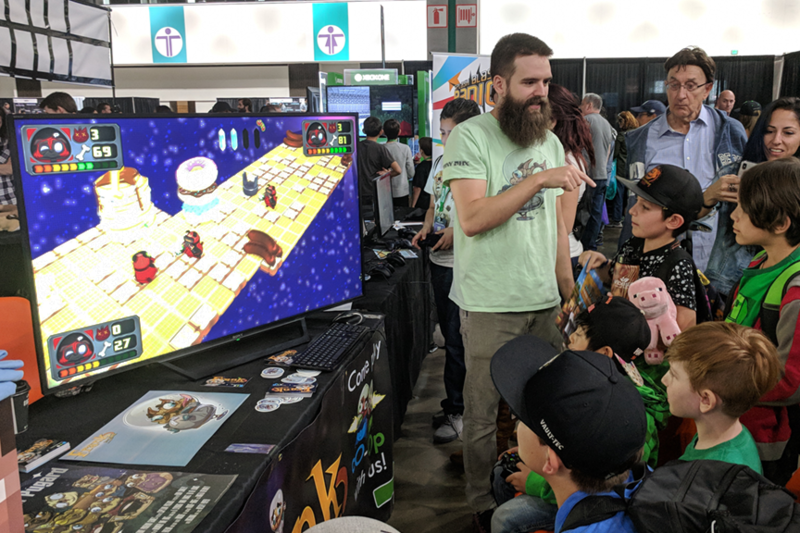 Steve Isaacs reached out to the group offering free space at Minefaire to come and share indie games. This was an amazing opportunity for us. It’s usually very expensive to go to a convention. At Phoenix Comicon and Fanfest, on top of regular booth fees we also had to dish out an extra $200 bones for access to power. The total costs for Minefaire included only gas and extra stickers. As an added bonus, one of my besties, Joby <3, lives right by the convention center and said we could crash at his place. My girlfriend, Alex, and I packed up the car and headed for the coast. 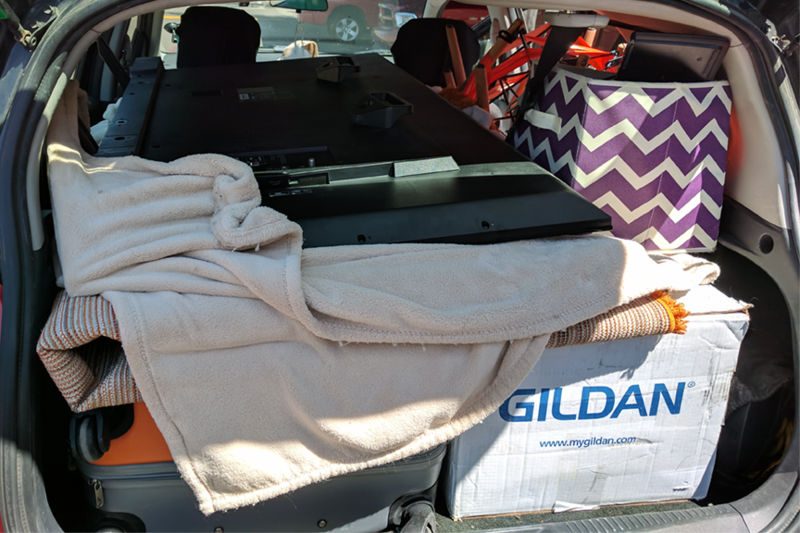 Ok… I packed up the car while she laughed and said it would never work, but my Tetris skills prevailed! In preparation for Minefaire we wanted to do something special, so we made a tribute skin and accessory that everyone was ecstatic to see. 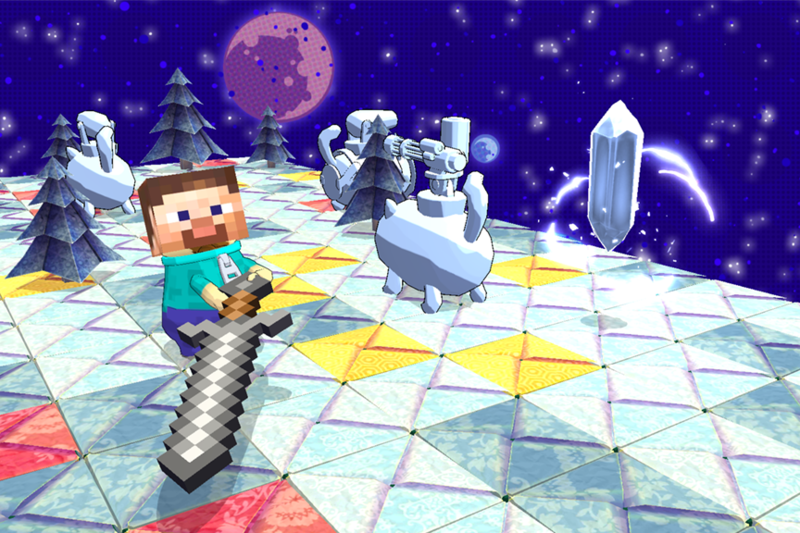 We also threw a temporary replacement for Frank’s sword into the game. When we got to the convention, we had a small setup but were able to make it work. In the background you can see them testing the big screen by playing Mincraft! We set up right next to code spark which was great for the unlimited questions I get about how to get kids started coding. All I had to do was point right next door. After a few test plays we we’re ready for another successful, and bug FREE, convention! But in all seriousness, I had to constantly kick kids off the game so people who we’re waiting could play. We couldn’t have dreamed of a better response and, as with previous convention, our motivation tanks have been refueled to move us forward at full speed! 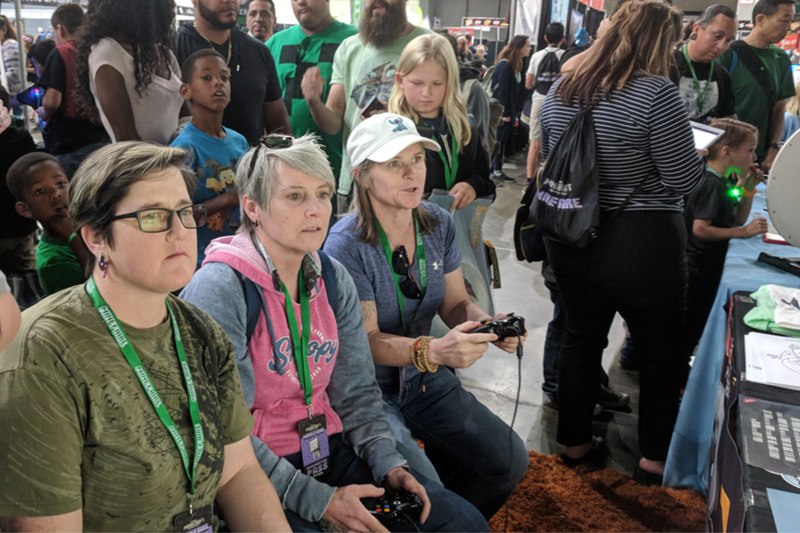 Thanks to everyone who stopped by and played and a special thanks to Joby, Alex, and Liz for giving their whole weekend to helping! The next convention is the Game On Expo in August. That is when we want to have a Beta out on Steam and Google Play. We've still got a ton of work to do so wish us well and be sure to follow us on twitter for more frequent updates! If you want to follow what we're working on and see the futures plans you can check out the Frank from Earth Timeline - Trello Board. You can download Frank from Earth here! I have been there, soon i will make gaming videos of this! AWSOME WORK! Awesome, did you go to the LA show or one of the other locations?